After eleven years of looking for gravitational waves, which are created when two black holes merge, scientists say that its existence cannot be proved yet, according to a study published in the Journal Science. Dr. Shannon, lead author of the study, said that “His is probably the most comprehensive, high-precision science that’s ever been undertaken in this field of astronomy”, in a press release made by the Commonwealth Scientific and Industrial Research Organisation (CSIRO). The Parkes telescope in Australia looks for gravitational waves using a method called “pulsar timing” from Earth, but it hasn’t worked yet. “If a gravitational wave were to ripple in the space between a pulsar and Earth, it would have changed the distance between the two bodies by approximately 10 meters”, CSIRO said in a press release. This is one of the last theories proposed by Albert Einstein and followed by many scientists, that hasn’t been confirmed by now. 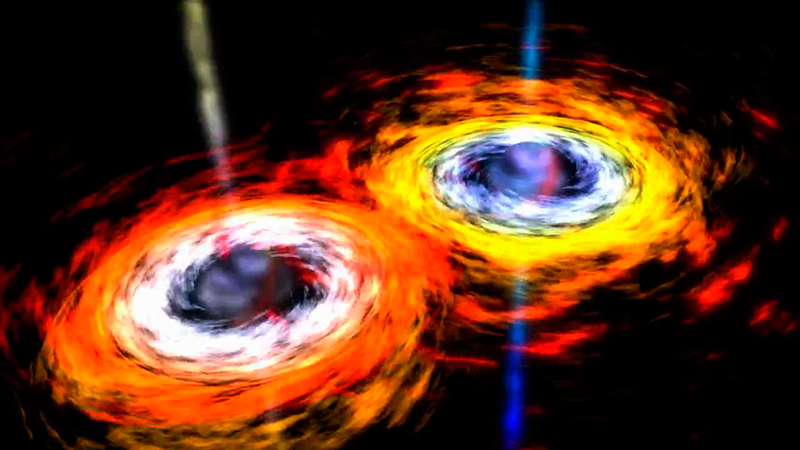 Einstein believed that these waves appear when, in the middle of a galaxy collision, two black holes spiral each other, creating waves that could bend space and time. This could potentially mean getting data and information from the very beginnings of the Universe. Some scientists say, according to Mashable, that the very large galaxies already have a supermassive black hole at their centers, meaning that when they merge it produces the ripple and sends the gravitational waves. Vikram Ravi, co-author of the study said, “The main reason we were surprised by our result is that we didn’t see the gravitational wave signals predicted by many teams of theorists. That is, we’ve achieved our design sensitivity that should have yielded a detection of gravitational waves, but didn’t. Our result means that theorists need to come up with new models for gravitational waves from binary supermassive black holes”, to Mashable. Some reasons that could explain why they haven’t found the ripples yet, can be due to the fact that the process takes place at a velocity greater than expected, which can be an environmental factor that make them so difficult to detect. Also, they believe they have to continue working on the Pulsar technology to get this particular gravitational waves, proving other signal lengths. “In short, there is still a lot of room to ‘play with the models’ in a physically sound way and still be consistent with this result, without invoking a radical change in our understanding of massive black hole evolution,” told astrophysicist Alberto Sesana, another researcher that is not part of the study, to Mashable. This means that researchers have still a long way to go to prove Einstein’s theory, but it doesn’t make it wrong yet.